Justice Anthony Kennedy recently announced his retirement from the Supreme Court. Except for death penalty cases, Kennedy rarely voted in favor of criminal defendants. He opposed Apprendi, Booker, Alleyne and many other “seminal” criminal procedure cases handed down by the Court. 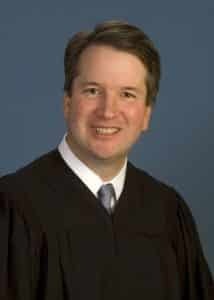 Thus, while some oppose President Trump’s nomination of Brett Kavanaugh to the Court, a future “Justice” Kavanaugh may be good for criminal defendants. On some issues at least. for 12 years. Over those 12 years, he has authored a number of opinions in criminal cases. He has also penned numerous notable dissents. While Kavanaugh does not seem to be the best defender of the Fourth Amendment, he does not like “acquitted conduct.” United States v. Brown, 892 F.3d 385, 415 (D.C. Cir. 2018) (Kavanaugh, J., dissenting). Brett Kavanaugh is also a huge proponent of requiring the Government to actually prove mens rea, the intent to commit an offense. United States v. Williams, 836 F.3d 1, 20 (D.C. Cir. 2016) (Kavanaugh, J, concurring); United States v. Burwell, 690 F.3d 500, 527 (D.C. Cir. 2012) (Kavanaugh, J., dissenting); Lorenzo v. Securities and Exchange Commission, 872 F.3d 578, 598 (D.C. Cir. 2017) (Kavanaugh, J., dissenting). Kavanaugh has also ruled favorably concerning claims of ineffective assistance of counsel. United States v. Noye, 824 F.3d 1129 (D.C. Cir. 2016); United States v. James, 719 Fed.Appx. 17 (Mem) (D.C. Cir. 2018). Kavanaugh has also shown some love in sentencing error cases. United States v. Jones, 697 Fed.Appx. 2 (Mem) (D.C. Cir. 2017); United States v. Burnett, 827 F.3d 1108 (D.C. Cir. 2016). So while many are concerned about Kavanaugh’s potential vote in “social” issue cases, I think there is a strong chance that he will be a good justice for some, but not all, criminal issues. Some of you may recall that when “Dimaya” split 4-4 last year I accurately predicted that newly seated Justice Gorsuch would break the tie by voting in favor of Dimaya. Justice Gorsuch’s favorable criminal defendant votes have surprised many. Expect similar surprises from Brett Kavanaugh if he is confirmed as the next Associate Justice of the Supreme Court.